In this article, I’m going to describe how to execute CRUD Operations in Azure Table Storage. CRUD stands for Create, Read, Update and Delete. I'll show you the entire CRUD operation using ASP.NET MVC application, step-by-step. Azure Table is structured column storage on NoSQL Cloud Database. It is not a relational database. Azure Table Storage can store just a table without any foreign keys or any other kind of relation. These tables are highly scalable and ideal for handling a large amount of data. Tables can be stored and queried for a large amount of data. The relational database can be stored using SQL Data Services, which is a separate service. You can get more overview of Azure Table Storage from here. To create this CRUD operation, the following skills should be considered. 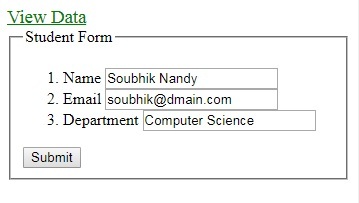 Insert and Edit Screen - Here, I used a HTML form. At the time of edit, I'll fill it with Student data. Get and Delete Screen - Here, I use an HTML table. There are three buttons here - Edit, Change Status, and Delete. 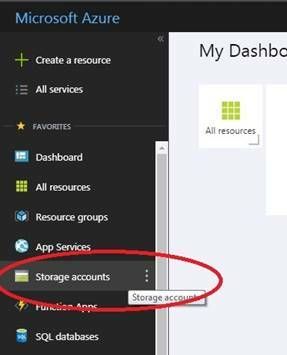 Create Azure Storage Account. Go to https://portal.azure.com and create Azure Storage Account. 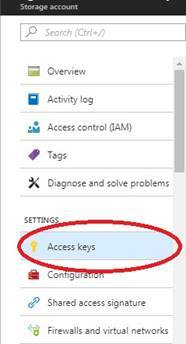 After creating Azure Storage Account, go to that account and copy the access key and connection string of that account. It will be used in our MVC application. Go to NuGet Package Manager console window and install -> “Install-Package WindowsAzure.Storage -Version 8.1.1”. Add “TableManager” class for accessing the Azure Table. And, use two namespaces. Remove the default Constructor from “TableManager” class. And, add a parameterized Constructor with the string parameter. This constructor will create the table if it's not there in Storage. We put the Azure Storage Connection String in this constructor, which was declared above. Add a generic method for Insert or Merge/Replace into "TableManager" class, where the generic value should be an inherited object of "TableEntity". I use Repository Pattern here. Why do I use Generic Method? Azure Table is Column-based NoSQL. Here, we can store any kind of Data and any Object. This is a flavor of NoSQL. We don’t know, which type of object we are going to insert. If we use a generic method, we can access any object. Similarly, add another generic method to Retrieve entity into "TableManager" class. In this method, you can pass the query. According to query, it will return the dataset. Now, the question is, what kind of query can we pass here. Here is the demonstration of how to use the operator in Azure Table Storage. I’m using Student Object here. I want to get the Student data where the name of the student is equal to Albert Einstein. Add another generic method to Delete entity into "TableManager" class. Add Model, “Student.cs”, which is inherited from Microsoft.WindowsAzure.Storage.Table.TableEntity. Add a controller named "Home". There will be a default Index Action Result; just add a parameter named id as string. Note - I am going to use partition key and row key in the coming codes. If you want to know more about partitionkey and row key, get it from here. Then, right-click on Index and add an empty View for Insert or Update screen. Put an HttpPost Action Result into Home Controller. Add another Action Result into the Home Controller, where we can get all records from Azure Storage. The View of Get Action Result looks like this. Add Delete action result into Home Controller. You must get the entity object first to delete that entity. You can handle the error by Storage Exception class. Find the error list here. If we notice in the Azure Storage Explorer, we can see the data like this. See, the Department is blank for Albert Einstein.